In this post I will list every PBN footprint that is out there. I don’t believe Google has any other footprints that they can use other than these. Follow these and you will build a rock solid fortress around your properties! PBNs are a powerful way for doing SEO and still work like crazy. However, if you are careless and you don’t follow some basic steps – it can reduce your effort to zero overnight. So, if you want to protect the time and money you put into building out your Private Blog Network and use your PBNs to do SEO like a ninja – make sure you read this post in its entirety. What is a PBN footprint? Interlinking Within Your Network Sites! Put simply – a PBN footprint is a unique identifier across all your PBNs. It is something (an element that exists on the site – code, image, domain related hsoting etc) that could be used to link your PBNs together. There is no such thing as “no footprint”. It’s only a question of how severe a footprint is and how many footprints you trigger. If you leave behind footprints for Google PBN detection algorithm (I’m sure they have one internally) – then your entire PBN can get deindexed or it will get passed to their manual review team. This is a real human is given a checklist of items that a machine cannot detect easily. This happens when Google algorithm is unsure about your site and cannot just strike it off as they may hit out on a false positive and may hurt a real site. So, they send in a real person to do the last step inspection – and decide if each site needs to be deindexed or not. To minimize each footprint – you need to emulate whats happening around the web naturally. This allows your PBN to hide amongst the sea of legitimate sites! Any common unnatural deviations from the natural occurrence elements that Google is measuring for detection of PBNs – and your site will stand out by leaving footprints. So, if you trip the threshohold, the spider comes in and forms a cluster around the entire vicinity of sites. The Google algorithm will then zero in on your network of sites and start checking all the parameters more vigorously (even start treating all the light and non-sever parameters with sensitive threshhold levels). Now that your sites are suspect of being part of a PBN – they want to inspect you very closely. Basically the algorithm gives points for each footprint it detects – but it turns up the dials and stars being more severe when it starts suspecting a cluster of sites as being part of a PBN. The game changes then as your network goes into a close algorithm inspection! Once you trip and fail that inspection – your sites are either de-indexed or they go to a manual review (where a real person is given the job to visit your sites with the aim of checking elements a machine cannot). You will see visits to your PBN sites in your server logs coming from Google office locations. Make no mistake this is a blackhat technique and Google does NOT like it and will come down hard by de-indexing all the PBN sites they discover without warning. Your goal is to minimize your footprints and make your PBN sites look real – so when a Google appointed manual reviewer does visit your site with their tools and set of checklist items they don’t enter the things that work against you. 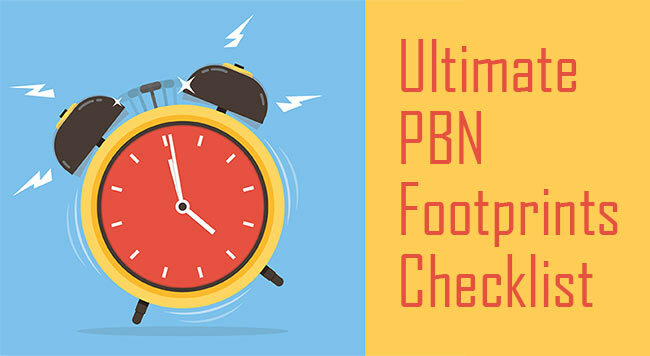 This PBN footprint checklist is in no particular order of priority. Please make sure to opt-in to my list below, so you get timely updates and alerts if anything new is discovered. SOA (Start Of Authority) records are what shows up inside your WHM (webhosting) panel when you have a VPS server in which you can create sites that are then managed by CPanel. The SOA record contains information pertaining to the domain name – such as IP address and DNS it is hosted on and in WHM even the admin email address is stored. Hosting companies use different tools manage hosting and WHM + CPanel is just one combination. If you order a few sites from the same host that are on a shared server and not your own VPS – you are relatively safer as you can hide in their cloud of other sites, but with a VPS that you manage – you need to be very careful. If you are using WHM panel for managing your VPS for your domain hosting, you can look for “Edit DNS Zone” and then choose your domain and click to see and edit your SOA data. You can block crawlers and spiders of various search engines and tools. You do this because you do NOT want a backlink indexing and crawling service like Ahrefs or Majestic to crawl your site and include it in their database – so that your competitors could snoop on your sites and uncover your PBNs – and proceed to report it to Google! So while this an important step to take, and you do want to block crawlers – if you start blocking ALL the same crawlers or a vast common list of ALL them – across ALL your PBN sites then this leaves a footprint. So, make sure that you firstly block all the top popular bots and then randomize other blocks. It is not a very severe footprint but is one nonetheless, that can be used to feed the PBN detection algorithm that Google has. If all your PBNs have content on them that are totally unrelated to the site they are trying to rank, then this can raise some flags. Google want to see links from niceh sites going to other sites in the same niche and that belong to the same content clusters, ie. “topically relevant sites”. Its ok to have a few links coming from unrelated niches or authority sites – but if you only have general content linking to your money site and all the links coming from a PBN farm that has all kinds of topics on each of the blogs – then this is a big red flag. This is another reason I don’t ever buy links from PBN link providers – and why you should not – and why you should build out PBNs that you control and that are specific to the niches of your money sites. A CDN (Content Delivery Network) is a site that caches your site data and serves it out to the user based on proximity of the user to their different severs located globally. It is also used to mask your IP addresses and did work years ago but is no more an effective way to mask your PBNs that are hosted on the same IP. Some services that act as CDNs are MaxCDN and Cloudflare. They are amazing and make your site super fast and decrease load on your server. However, it only triggers a low level and that too if you do it in excess, and point all your DNS to the same Name Server your CDN provider gives you! If you must use a CDN atleast mix up the Nameserver by creatingh multiple accounts at the CDN. If all your PBNs have the same CDN provider (and worst if on the same Nameserver they give you) – then this could be a footprint. This is the exact opposite of the one above. If you don’t have any CDNs at all, then this could be a footprint, although a very small one. If you dont structure all your sites properly and have missing categories or organizing of the content, then this is not only bad for the visitor, crawlers, but can also land you up with low quality score signals with Google and thus decrease each sites link juice potential and rank passing ability. Have too many PBN sites constructed poorly and boom! you pass on another signal to Google from your cluster of PBN sites. There is definitely a very strong correlation with PBN sites having a low number of blog posts and pages and deindexation. Having lower than 10 posts is a bad sign. If you have 5 posts and just say 2 pages and 301 and 404 pages – you are asking for trouble. Make sure you have at least 10 to 15 posts within the first couple of weeks of your site going live and then keep posting regularly every week or two – with more authority (powerful) domains having more frequent updates and new content posts. When you register your domain name you can choose to hide the registrant name or not. If all your PBNs have common registrant, then you are toasted. This is the single and most fatal way to get detected. If you all your PBNs have no private whois info at all, and maybe all varying but fake registrant info – then not having any private whois on all the domains is a footprint as well. If all your PBNs have a private whois and absolutely no visible valid set of different entities that registered the domain, then this is a pretty severe footprint. Real businesses use real addresses and not just private hidden registrations. Nameservers tell the internet browsers where the site is hosted. If your nameservers for all your PBNs point to the same host or IP – then you will get detected very fast as this is a massive footprint and its the easiest one to detect your PBN. For some domains you should use the default nameservers provided by your hosting company like – us102.hostgator.com, ns1.digitalocean.com, etc. When you register the domain name, make sure to use unique email addresses for each domain name. Do NOT repeat even a single email address. The email address inside your whois registration – NEEDS to be unique. Do not ever use the same email for any 2 PBN sites – easy way for Google to detect and get into your PBN network and then crawl your entire PBN and detect it. Never use Gmail for your PBN email registration address even if different for each site. You can lose your registration if you use an email address on the domain you are registering at the time of registration – because you wont get to setup the domain name on your host without first verifying true ownership of the domain name – and thus you wont have access to the email address on the domain to do the verification! Make sure you use free webmail providers – but do vary the privders. Try not to use the big ones like Yahoo Mail – as it may be possible that Google has insider deal with Yahoo (my conspiracy theory only). And yes, a brand new email and admin account for every website is highly recommended. Never register a whole bunch of PBNs on the same date. I made this mistake with my first PBN and I regretted it. I found a huge bunch of high quality expired domains and quickly rushed to grab them before anyone else – all on the same day! duh! That left an easy footprint for Google to check in the whois data – if they ever wanted to.. and so I could not proceed with using all the sites for my PBN, as there was risk associated with this footprint. This is not necessary, but doing it just might give you some extra protection. Vary the period of domain registrations of each PBN site – most 1, but some 2 or 3 or even 5 years. You need to make sure you use different hosting providers. Don’t buy from resellers of top tier hosts and make sure they have their own Nameservers and they are unique. I would not use any cheap hosts. But if you must try and cut a cost for a low value expured domain, please dont go overboard with using too many cheap $1 hosts. I’ve written about this in my other blog post and you must check the health of each IP address. To do this you simply need to first find all the domains hosted on an IP address and then check to see what ratio of sites hosted on that IP are deindexed using a tool like Scrapebox. You can check quickly to see which sites are hosted on an IP address using bing.com search. Just enter the following search parameter – ip:123.456.789.0 in the search bar and it will give you a lit of all the sites hosted on that IP address. Alternatively, you could use a reverse IP lookup tool. Never build yoru PBNs on the same TLD just because you found a whole bunch of good expired domains on that TLD. For example if you are from India and you only find and use .IN expired domains – then that IS a footprint and becomes more severe as your PBN size grows. So, don’t use only the same TLD – be it .com .org .net .whatever. In the early days SEO hosting was all the rage. It was cheap and promised a lot. However, Google was very quick to figure out how to detect SEO hosts and penalize all the sites hosted on them. If you sign up at an SEO hosting service you will be positioning yoru websites amongst other PBN sites. This is a huge red flag and it is very important you DO NOT use SEO hosting. Make sure that your IP addresses on which your sites are hosted are all unique and are not in too close / proximity of their C levels…. AAA.BBB.CCC.DDD (make sure CCC is diverse at the very least and don’t have numbers that are very close to one another – and that DDD always being unique at the very least). BBB and AAA diversity is a bonus and should be done if your PBN gets larger and larger. Check to see if the datacenters of the server locations of the hosting providers are different. Don’t get stuck in the same data centers from reseller hosting companies all in the same geo-location. If all your PBNs keep going offline (because of cheap hosting) then this can be a red flag. You need to vary the use of your CMS once your PBNs start increasing in numbers. Just make sure to have around 30% to 50% different CMS platforms etc. once your PBN numbers incrfease in size. True that over 35% of sites on the web are powered with wordpress – so you need to build in this randomness as well as your numbers get big. When you register an expired domain you need to make sure that our PBNs have some domains that use the same content that was on them before thee expired (this is called resurrecting sites). You can do this from WaybackMachine at web.archive.org and take content manually or use a third party resurrecting service like waybackdownloader or a tool that scrapes the content from Wayackmachine. Make sure your PBNs dont all use same wordpress theme, or just different templates from the same master wp theme. I personally would diversify this as much as possible only using common theme for a few – IF the common theme was a very popular theme. If all your sites have generic logos that are in Text format and no custom built logos – then thats a flag as well. If you must use one of the free online web logo creators – make sure you use different services as each tool may leave their own footprint in the EXIF data! Another big red flag! For heavens sake – don’t put all the same plugins across all your PBNs. Google can see what plugins you use and you need to be varying them. Sure, use the common popular plugins with higher probability – but don’t have a similar bunch of plugins across all your PBN sites. Each PBN needs to look different and be authentic. By this I mean it needs to look real. Should have a different structure like different post count on homepage, different widgets location, socials, optins etc. Make them look real and make them look original! If you ever get a manual reviewer to visit your site – this is what will protect you! Having social profiles and inserting their links to visitors to your site is natural and majority of sites have them. If you don’t create any unique social profiles for any of your PBN and then as a result all your PBN sites lack any social profile mentions or links – then this can be a severe footprint as the size of your PBN grows. Make sure that you use random and different names for each author when you post blog posts in your PBNs. Also, make sure that if you must connect to Gravatar accounts, they should be unique accounts. Not only can this leave a minor footprint if you don’t delete the sample blog content post like “Hello World” but it can be sloppy. Sure you can do 301 redirects from pages that you dont want to recreate when you buy an expired domain, to the main homepage. But, note that Google has stated that 301 redirects from inner pages to the homepage are treated as “soft 404s”. So, you should avoid doing this excessively within each PBN site and across all PBNs. A better way would be to do 301s from the old missing URls to other new pages you create with similar content as the missing one. Then you could link from this new page to the homepage if you wanted to pass the juice down to the homepage eventually. You could also 301 the missing page to your top categories or top pages of your PBN site. Don’t have posts on your site made by hidden profiles and with mystery shadow authors. The more you ensure that the authors have bios, links to their linkedin profiles, and photos in the sites – the more real your site will look and will withstand a manual review if the PBN detection algorithm pushes your site for a manual review or a manual PBN check. Just make sure you don’t copy the same content into all your PBN sites! And, also make sure to vary the naming convention and slugs and names a bit. You nee to have some address through which you can be contacted. Make sure at least 20% to 30% of your PBNs have a real address, and the rest can have email address. Have a varying and unique address. You can always get address from fakenamegnerator.com but make sure you dont overdo it and use different countries and regions. If all your pages of your PBNs link to one money site and one site only – how obvious a footprint is that? Imagine a site getting 10 links from each site over a set of 20 sites. This will get you busted with or without a PBN. This is a Penguin related footprint and will hurt your site the most. Do NOT use the same money keyword anchors or any other anchors over and over again- unless they are URL or Brand anchors, which should also be mixed up. You need to have links to other authority site in the industry, and make sure you shuffle them from PBN to PBN. Don’t link to the same authority sites or pages. Internal linking is a must do activity for every site out there. Make sure you are linking internally and naturally to the most important pages and posts. If your homepage is important then link to that from other pages. Never ever, never ever, never ever – link your PBNs together. Absolutely never do this in the hope of getting link juice flowing and building up their power. IF you want to build up power use Tier 2 links and Tier 3 links. How obvious would it be if all your homepages had the same number of links and posts? Sure, WordPress has a default setting for 5 posts to show up in the hompeage feed – but imagine if this was the case on all 100 PBN sites. Footprint no? You could mix up things by having the blog feed appear on some sites and a fixed homepage with different design on others. Make sure you diversify the number of links in each of your posts across your PBN. Don’t just put one link at the end of each post even if its anchor text optimized. That’s still a footprint. When you insert links in your posts, diversify them even more by changing the link types… have more contextual links, some image links, some blog comments, footer linkls, widget links, social profile links etc. This one is important. If all your PBNs have plain text content and no rich media embeds like images, videos, perhaps infographics, remote feed embeds like tweets, scoop.it etc. then that will defintely count towards a footprint. Google may think you’re running some sort of text sraper and spinner tool. Don’t spin and use garbage text content using automated scraper and spinning tools. If you must spin content – at least make it high quality spins and don’t overdo it across your PBNs. Bad spinning of content happens when you lose low quality spinners that mix up the text and make it nonsensical grammar – thereby triggering a bad grammer / nonsensical language detection filter. If all your PBNs have scraped and/or duplicate content from other sites that is already indexed by Google then this is a footprint. Duplicate content will just cause your site to be neutralized by Google making it sort of “dead” with no ability to pass any juice and not rank. Sure, duplicate content pages can rank and still do… but, there is a low threshhold in Google tolerance. Sure, you can curate content and take summaries of snippets from different sites and put them togther on your PBN sites. That is an acceptable strategy even on your money site as there is value and thought when you curate content. but, you must add your own commentary and value to the content at the beginning or end of the post. Google wants to see that. And, defintely, don’t go overboard by only using curated content posts. You can get away with this technically and embed other niche videos from Youtube. This is not severe. If you must embed videos, make sure some a original. Don’t just keep embedding any random videos from Youtube. Your PBNs must get some traffic from real visitors. It must rank a little bit at the very least for some keywords and the sites in your PBN must get some traffic and interactions happening with low bounce rates and higher dwell times – and most importantly with clicks on the OBLs (Out Bound Links) where they actually click through to go to the sites you link to (if they are your site or other sites). Also, it always a plus point if your have a contact form on your site that some percentage of users interact with. That signals a termination of user intent – which is a good quality signal. This is always a bad sign – whether it happens on one site or multiple sites. Its worse if it happens across all your PBN sites and could lead to a quick manual review, and de-indexation. If all your new posts across all your PBNs happen at around the same days/time – all together – then that IS an easy trigger to detect. If you must schedule posts via your WordPress admin or a remote blog network controller tool like ManageWP – make sure you still randomize the publishing schedule and time on each site of your Private Blog Network. If you must use analytics code (from traffic tracking tools like Google Analytics, Clicky etc) or for example advertising code from and ad network like Adsense – make sure the code is not the same across your network of PBNs. Do NOT under any circumstance insert Google Analytics code from the same Google Analytics account. Keep it different, and if you access the GA admin areas for each site – access it from different proxies. I would avoid inserting GA code, and just use different third party trackers or not use any traffic analytics trackers at all. If I did use a third party – I would work in Firefox Private browsing mode via proxy protection once my PBN size started to increase and scale. I talk about how to do this in my main PBN guide here, but I am thinking of making an advanced video showing how I do this. This is very important to do once you scale up and go into 100s of PBNs. If you use a third party application like Chat embeds (tawk.to etc) or Segment.io or any other web SAAS tool then you need to make sure you don’t embed the code from the same account across all your PBNs. If you use a weak PBN management tool (there are some I avoid that are in the market) – that leaves a footprint for Google to “look under the hood” and see that all your PBNs are using a specific PBN or remote blog management plugin – then it will trigger a manual review. This is why I use and recommend ManageWP because it hides its existence from Google on your PBNs. There is no way Google can detect your PBNs have this plugin installed… which is pretty neat. Don’t use Google Chrome when you browse on your PBN sites, and never use Google products like Google analytics or Webmaster Tools across your sites. Avoid this. Use Firefox browsing with proper protection enabled – like I have metioned above. If all your PBNs have 500 to 600 word posts – how obvious a footprint is that? Make sure you mix up your word counts across your PBNs and within each site. The ranges must be small, mid, large, etra large etc. Like a few small 200 word posts, some 400 to 600, then 800 to 1200, some 1500 some 2000+ etc. You get the idea. Your PBNs must have different feed types on your homepage. Some show full posts, some excerpts etc. Just vary this.. its not a big deal – but keep things different with only a few PBN sites having full homepage content if you must. Never, enter your PBN site domains inside Google all togther at some – and if I want to check if a domain is indexed or not right before renewing it, by searching the ‘brand name’ in Google, not using the site: command… checking too often may trigger some red flags. If your site is actually deindexed via the Google search command site:”yourwebsite” – and nothing shows up then you could use all of the content from that site on a new one. However, don’t overdo this for all your PBNs – event though the penalized content is not in their main database anymore – it could be in some shadow database, we don’t know! You can also just go to any of the free web based rank checkers and check for the domain name as the keyword itself. Be careful who you link out to. If you link out to a site that gets penalized or de-indexed, then your site can be in trouble. If all your PBNs have too many spammy links coming to them and are built on low quality or penalized domains – then you should not be using these domains in the first place. Every PBN site you make in your PBN needs to be made with the aim of withstanding a manual review – if and when Google’s automated PBN detection algorithm pushes your site for a manual review or a manual PBN check. Step 1 – Minimize your overall PBN footprints across all your sites collectively, by following all steps below. Step 2 – Withstand a manual review by taking the trouble to make each site of your PBN look as real and genuine as possible, by following steps below. Do note, that borderline cases are the ones that are pushed into manual review also by the algorithm, and the ones that are severe are automatically deindexed. Google is at WAR with PBNs only because they are working like gangbusters in SEO. So you absolutely don’t want to reach or cross any of the borderline or set threshold values. Great post. Out of all these which is the most severe footprint you think? There’s a bunch of them that are pretty fatal, but I’d say the hosting and the way you drop links to your money site (or if you link up your PBNs) is the most severe. Its the easiest way to get noticed and caught for deindexation! Its not a one time check. The algorithm updates the data each time the spider crawls your site data / signals and sends them for indexing. See so many people on FB forums blocking bots, its a total joke. Think of the database Ahrefs has on all these blocking sites! And yes they may not crawl them but sure they get put in a separate DB.